Hundreds of residents from Greater Jakarta gathered around the Arjuna Wijaya Statue area on Jl. MH Thamrin, Central Jakarta, on Saturday to join in the Bhineka Tunggal Ika Parade, which is the national motto meaning "unity in diversity". Wearing red and white clothes and traditional attire, the residents called on the nation to maintain unity amid recent tensions, including the attack on a church in Samarinda, East Kalimantan, which injured four children, one of which passed away. “We pray for the victims of the Samarinda church attack, our child Intan Olivia. We hope the incident will never happen again,” one religious leader who attended said, as reported by kompas.com. Besides interfaith prayers, the parade also featured music and traditional art performances, like Reog Ponorogo from East Java. The parade’s participants marched to the Hotel Indonesia traffic circle in Central Jakarta. 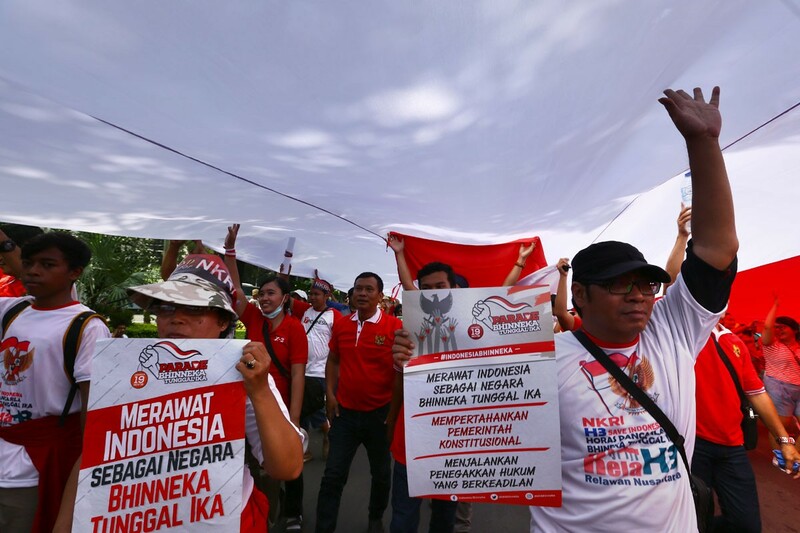 Some of the participants marched to Heroes Monument area in Central Jakarta. On Nov. 4, hundreds of thousands of people, led by conservative Muslim groups, staged a rally in the area, demanding the government to prosecute Jakarta Governor Basuki “Ahok” for alleged blasphemy. The rally ended in violence as two police vehicles were set on fire. On Wednesday, the police named Ahok a suspect in the alleged blasphemy case.